Back to more testing trying to get to terms with Hypersync. For a long-time shooter like myself there is a lot to unlearn and relearn with this technology. For my entire pro shooting career I always relied on the simple fact that shutterspeed has no influence on the flash component of an exposure as the flash duration was always shorter than the shutter opening. So when shooting outdoors using flash to balance the ambient light, this meant you could set your flash-to-model distance and power level and then chase the ambient light with the shutter, slowing down or speeding up as the clouds moving overhead would change the ambient light level. And when shooting models in front of sunrises and sunsets, the same would hold true. Keep the flash-to-model distance and power constant, hold the same aperture and chase the changing lighting conditions with your shutter speed. Well, all of this worked really well when using flash with shutter speeds equal to or slower than the camera’s sync speed. Now with the advent of HSS and Hypersync we are tricking the camera and getting the flash to sync at shutter speeds well above the camera’s advertised sync speeds. We know that shutterspeed will affect the ambient light exposure, but with these elevated shutter speeds, the shutterspeed is now also affecting the flash illumination on the model as well, something entirely new in my shooting experience, and it is a new aspect to shooting that I have to understand and relearn. So this round of trials is to try and understand how much the shutterspeed will affect the flash component of the exposure. My previous tests with Hypersync and the Alien Bees illustrated that very useable full frame flash exposure is possible up to 1/1250th of a second with this setup. I say “full frame” as with shutter speeds above 1/1,250th there was a slightly noticeable intrusion of the inevitable shutter curtain shadow banding that crept into the frame more as the shutter speed increased, making the one edge of the frame unusable. However if you fully understand the position of the banding and are prepared to compose your image accordingly it is possible to get decent images all the way up to 1/8000th of a second, but the flash exposure is being diminished several stops by the fast shutterspeed. As before, I established the desired ambient light exposure set the ISO at a constant 100, kept the Aperture at a constant F2.8 and varied the shutterspeed. Unfortunately a large cloud moved over the set as I did this so the exposures recorded are about 2 stops less than full sunlight, but the images nevertheless clearly illustrate the effect of increasing the shutterspeed on the ambient light exposure. As you can see from the images, the banding only becomes noticeable at around 1/2,000th sec, and only intrudes about 10% of the frame at 1/8,000th sec. The image is fully useable without any cropping all the way up to 1/2,000th sec, but this was not the goal of the test. What we can see is that increasing shutterspeed from 1/500th to 1/1,000th reduces both the ambient and the flash exposure by 1 stop, and there is a similar correlation from 1/1,000th to 1/2000th , from 1/2,000th to 1/4,000th and from 1/4,000th to 1/8,000th. So many photographers have reported widely diverging results with hypersync depending on the equipment used, so while the flash exposure appears to have a linear relationship with shutterspeed, I am hesitant to just accept this. I did the same test again with the Alien Bees at ½ power (controlled from the AC3 control) and the same relationship appeared to hold true but there was not enough flash illumination to make the images at the higher shutterspeed useable. This time I added two additional Alien Bees as rim lights about 10ft from the model. Because of my findings in the previous tests I limited the shutterspeed to 1/2,000th of a second. Once again the relationship of shutterspeed to flash illumination appears to be linear. Basically, with this setup it appears that if you double the shutterspeed you will decrease the flash illumination by one stop, which ultimately means that when you end up with an underexposed subject, you will need to shorten the flash to model distance, or add additional flash units to maintain the shutterspeed. But as you can see the results are very promising, and obviously more testing is needed prior to relying on this technique in a commercial shoot. And knowing how the banding will affect your image will allow you to use really fast shutterspeeds, as shown in this image shot at 1/4,000th second, 5 full stops faster than the maximum camera sync speed. 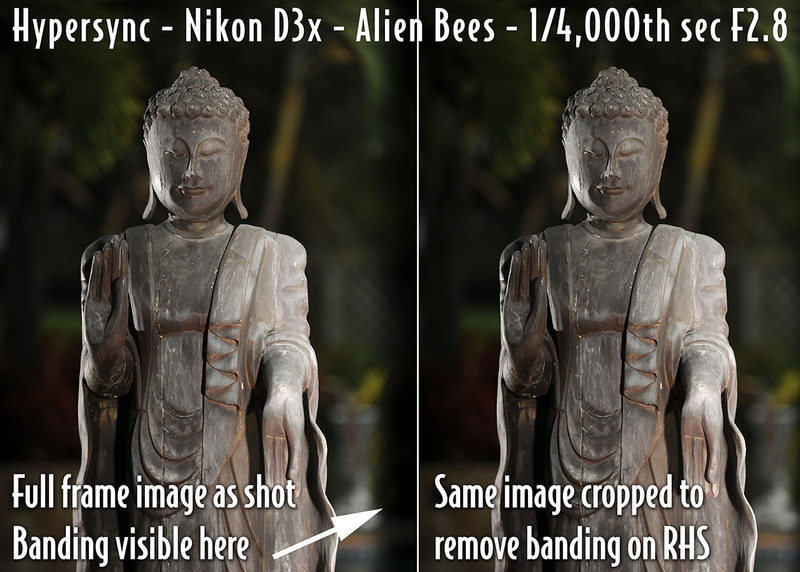 Click here to see my next Hypersync test utilizing Nikon D3x, Alien Bees and Pocket Wizard TT1 / TT5. High Speed Sync – 1/5,000th second at f1.4 in bright sunlight with flash! All text and images copyright of Danny Steyn Photography. No images or content may be copied without express written consent.